As a Californian, I think it's a bit funny that a third of my closet is consisted of outerwear. Most of my coat collection don't get to see the light but there's something about coats that I love and I just keep wanting more. 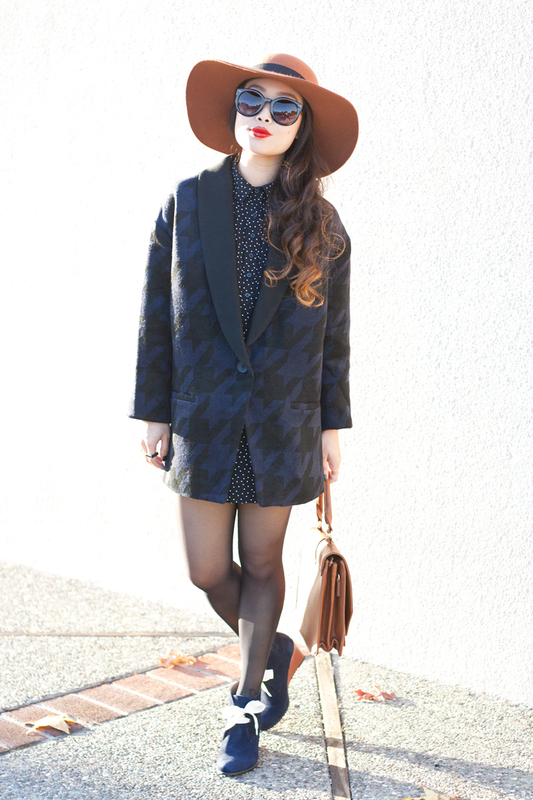 Then again, I also say that about shoes and bags and hats and dresses... Anyways, I am falling head over heels for this black and blue houndstooth coat from F21. I love the shawl collar, the cocoon silhouette and the oversized houndstooth (such a refreshing take on the classic houndstooth print). I paired it with a polkadot shirtdress, these amazing sheer tights with seams down the back from Wolford, and these lovely navy suede and leather wedge booties from the WHIT + Jacques Levine collab! 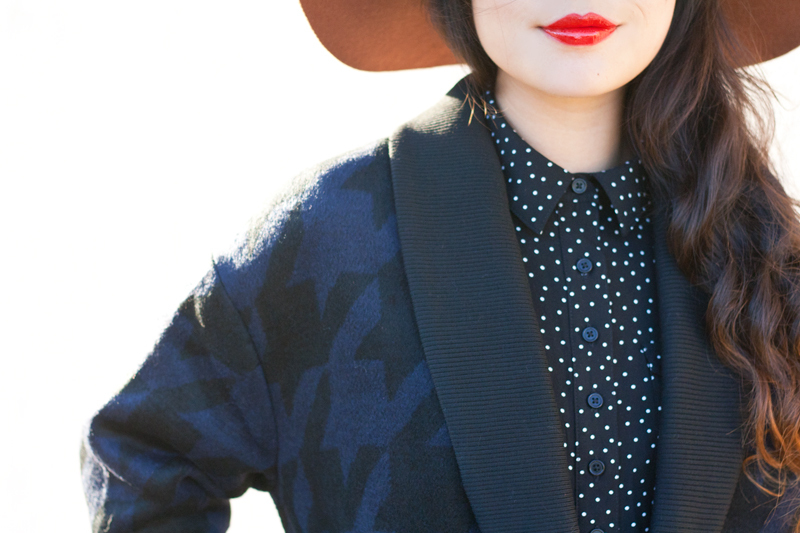 Polkadot shirtdress from Old Navy. Individual 10 back seam tights c/o Wolford. 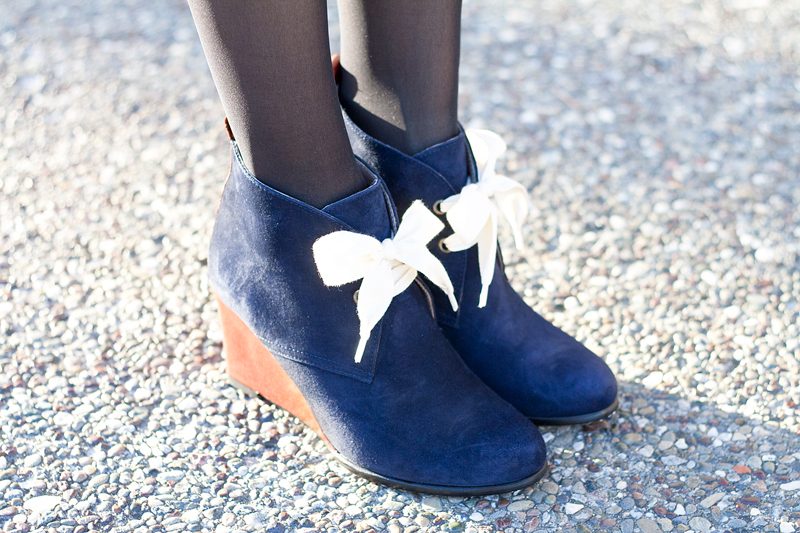 Gotland wedge booties by WHIT + Jacques Levine c/o Jacques Levine. 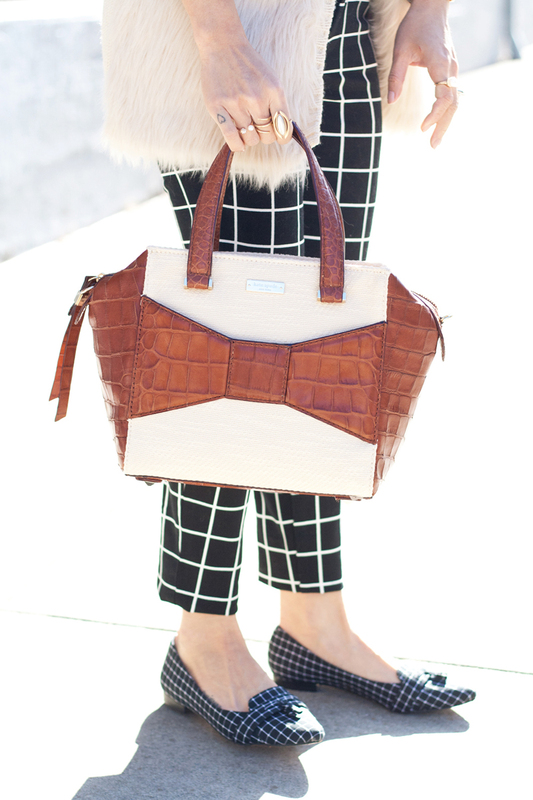 Baylen vegan leather satchel c/o Sole Society. 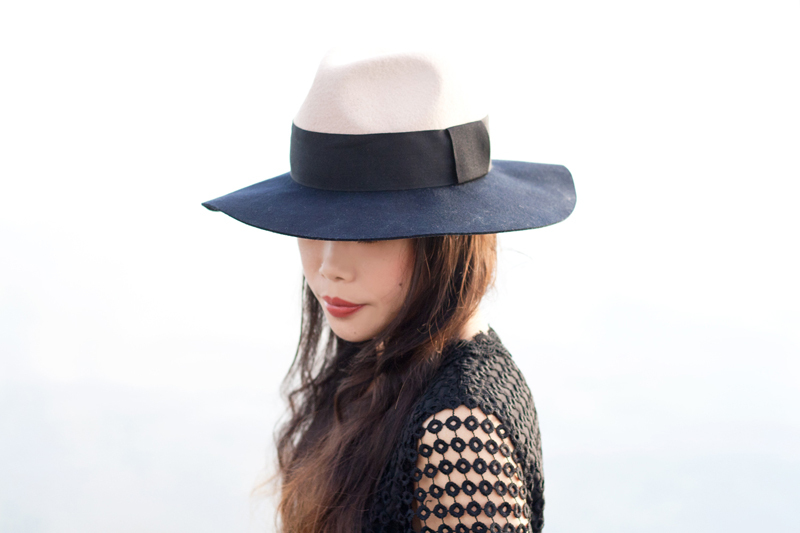 Wool floppy hat (old) by RVCA from Karmaloop. You know how sometimes when you go shopping and you see something you love that comes in different colors, but you can't decide on which one because they are all so good? 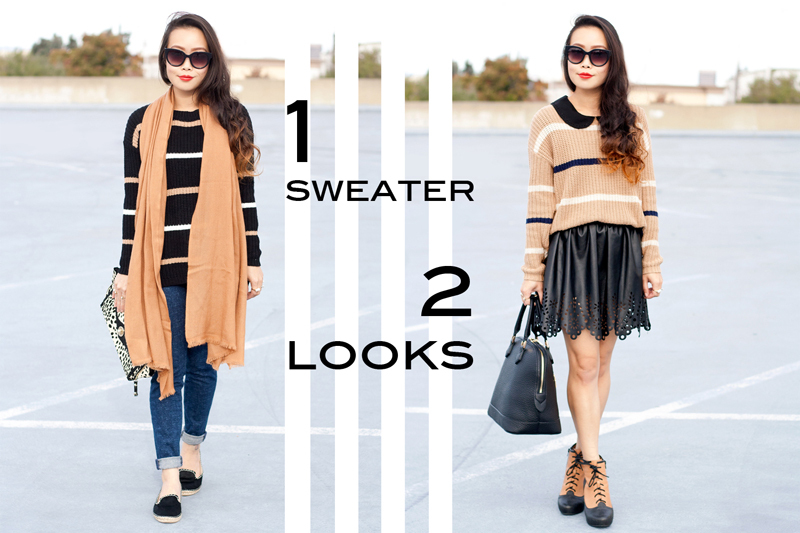 Well, that is exactly the case with this pullover sweater! It comes in black, tan, and olive and I almost got all 3 but had to limit myself to just 2! Wear it with jeans or skirt, you can't go wrong with this cozy striped sweater... especially after eating all that turkey and yams! Happy Thanksgiving! 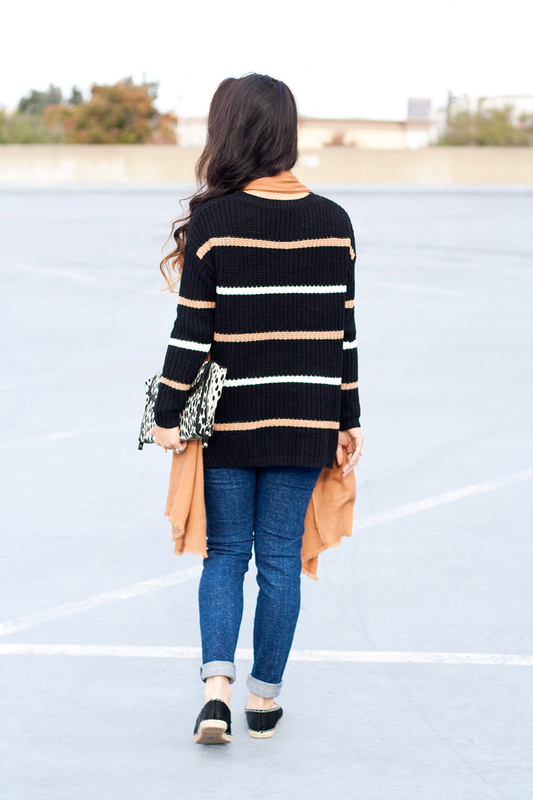 Striped knit sweater c/o F21. Empire cropped skinny jeans c/o Levi's. 100% Cashmere scarf c/o Casana. Phoebe animal print clutch bag c/o Sole Society. Topstitched ponyhair espadrilles c/o F21. Peter pan collar blouse (old) from F21. Perforated scallop leather skirt (old) from GoJane. 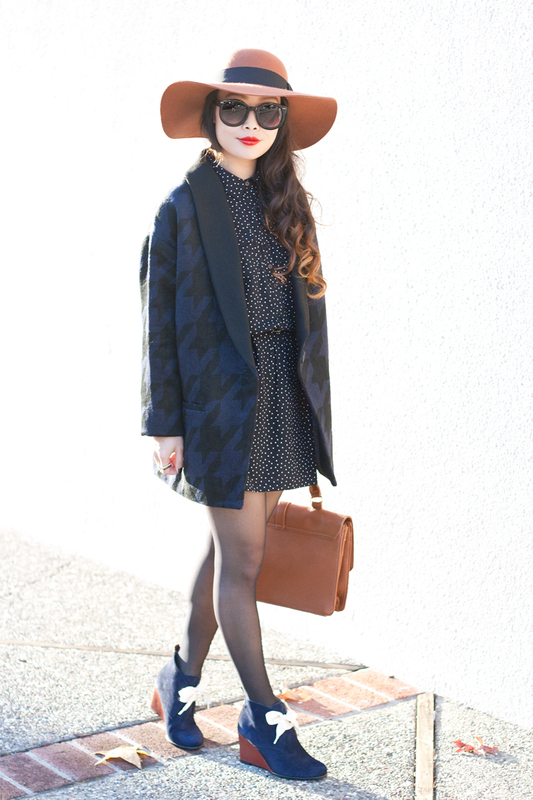 Black structure satchel c/o Lulu*s.
Somehow booties by Jeffrey Campbell from ModCloth. Did you know that many sites such as Kate Spade Saturday and Shopbop have already started their Black Friday sale? 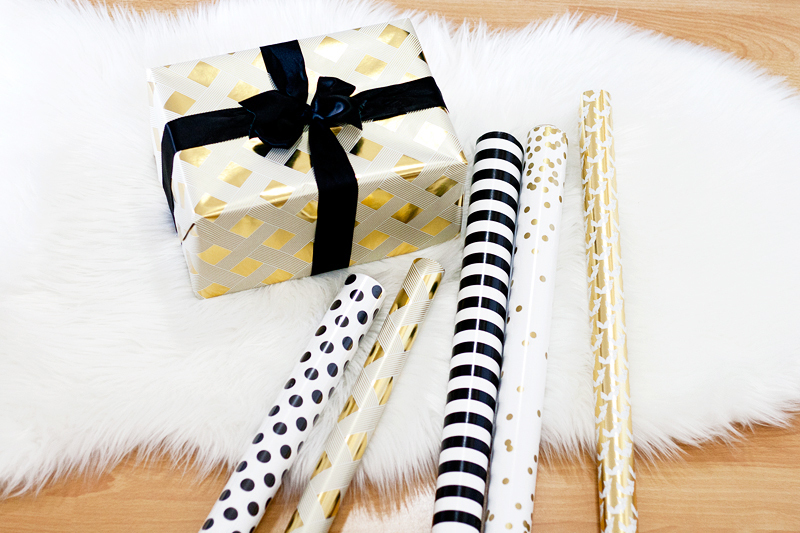 Whether you are shopping for others or for yourself, you can't go wrong with some fun polkadots and plaid or classic black and gold! Check out my favorite picks (and discount codes) below and shop the sales that are happening right now! 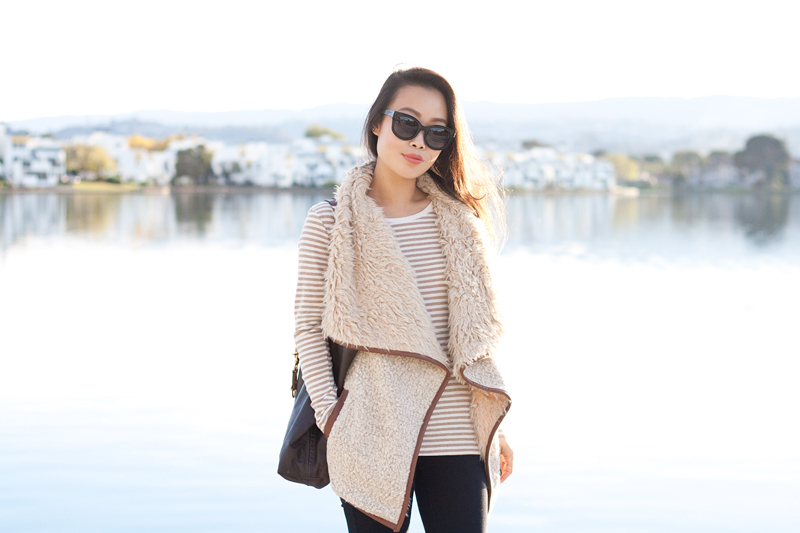 Counting today's post, I have styled a total of four looks with a vest in the past month (see here, here, and here)! So, it is safe to say that I have developed an infatuation with vests or what I simply call an "in-vest-uation". Vest comes especially handy in this California fall weather where the air is cool and crisp but the sun is still a bit warm. I love this F21 vest... the mix of faux fur and shearling makes it texturally interesting and the brown leather accent is a nice touch! Oh, and not to mention how cozy it is! I layered it with a simple striped top, legging jeans by Gap, over-the-knee riding boots from Prima Donna and my beloved Fount leather tote. 'Twas the perfect relaxing weekend outfit! 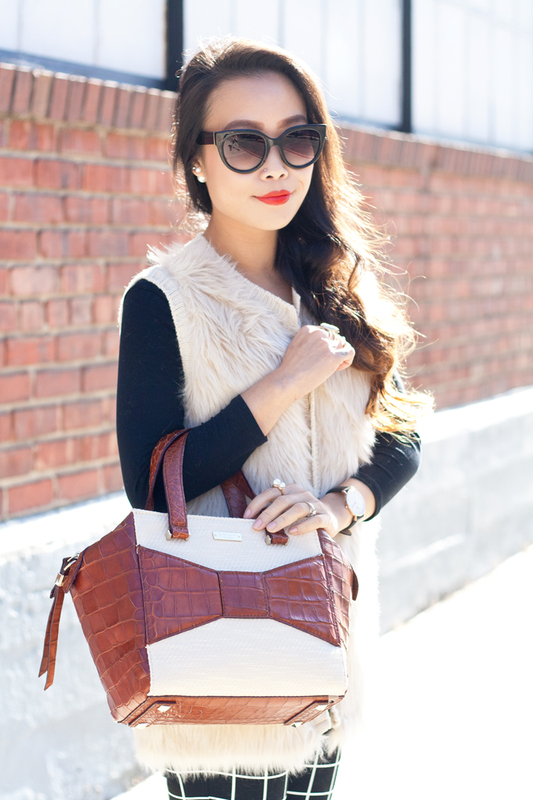 Faux fur and shearling vest c/o F21. Striped top (old from last year) from Old Navy. 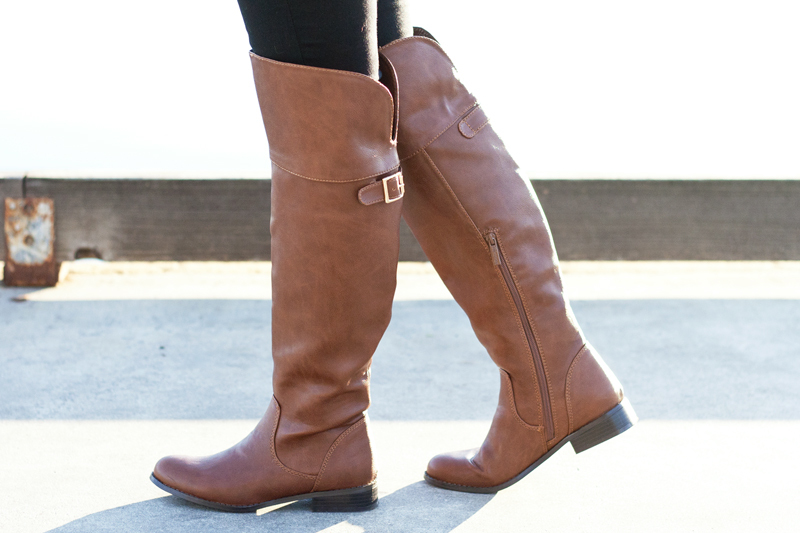 Over-the-knee riding boots c/o Prima Donna. 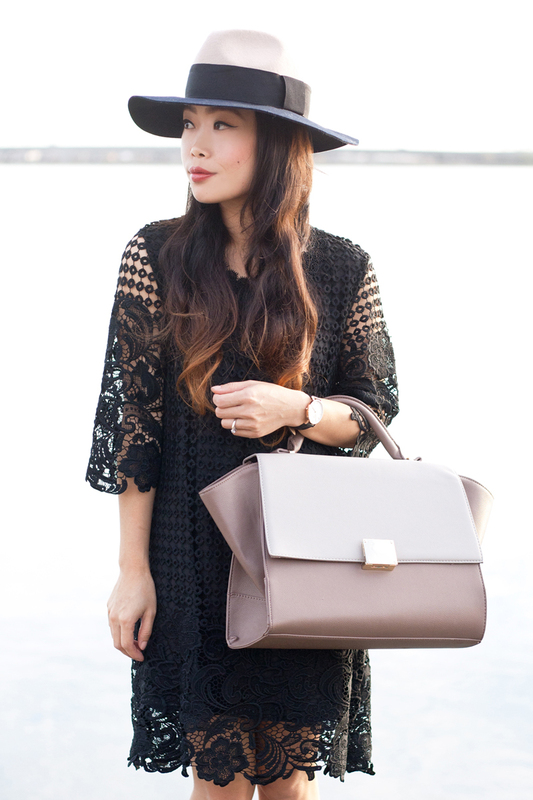 The Petite Bellfield leather tote in ebony espresso c/o FOUNT. Have you started your holiday shopping yet? I sure have! And of course the first present I bought is this gorgeous Kate Spade Beau bag for... myself! 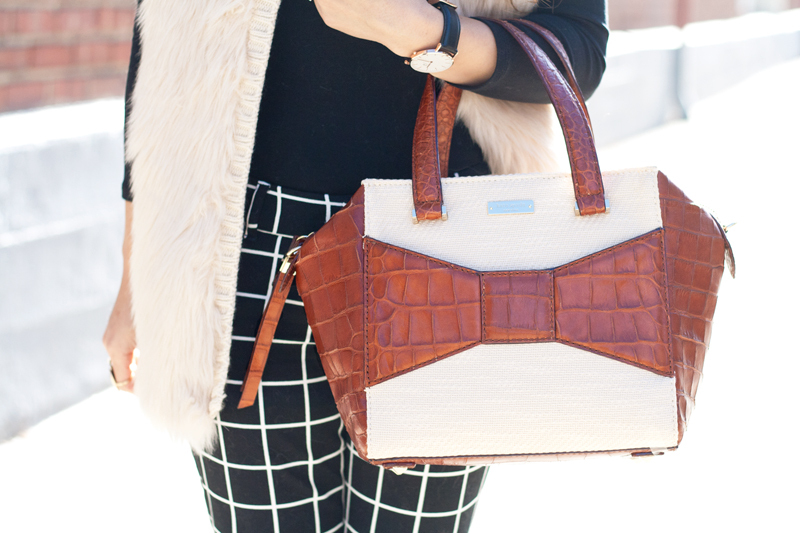 As much as I love the classic black, I decided on this one with brown croc embossed leather and twilled cotton. I thought this combo is a bit more unique and a bit more fun, at least for the holiday season! Another thing I have been quite obsessed with are the pixie ankle pants from Old Navy. I have four pairs in different prints! 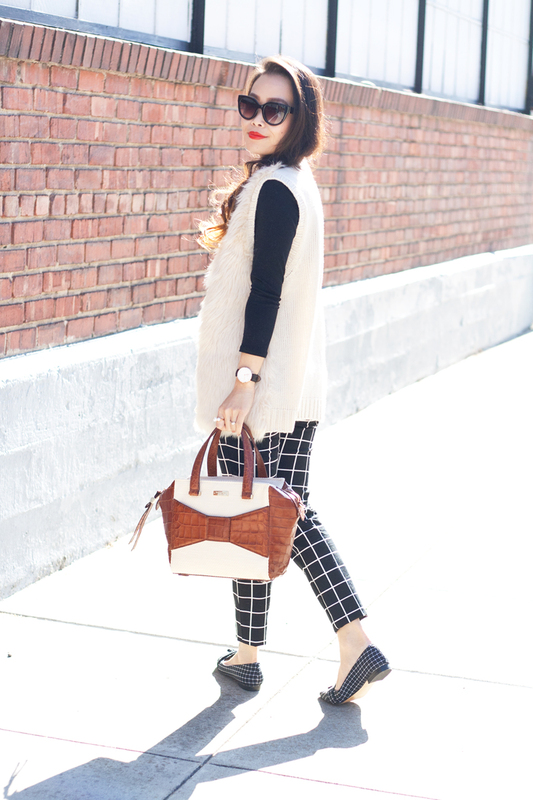 Here I am rocking the black and white windowpane print, styled with a simple black top, faux fur knit vest and matching windowpane tasseled loafers! So there you have it, another low key holiday look! Pixie ankle pants c/o Old Navy. 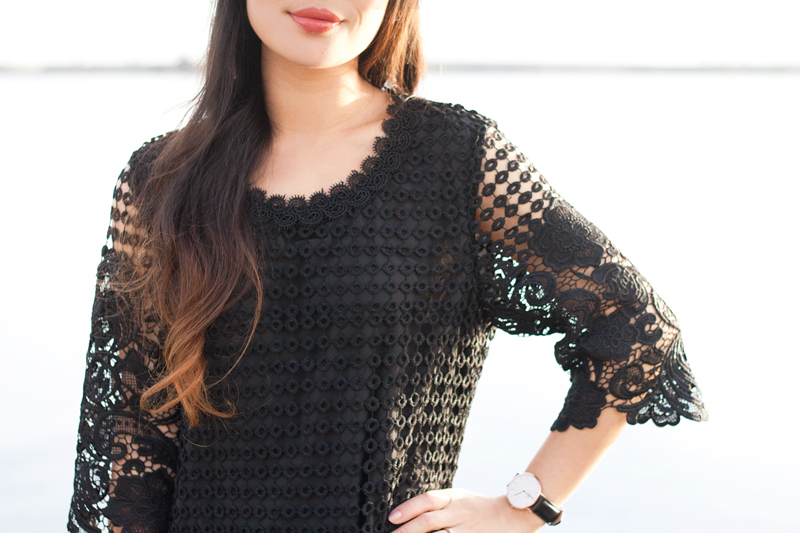 Black 3/4 sleeved top c/o Charlotte Russe. 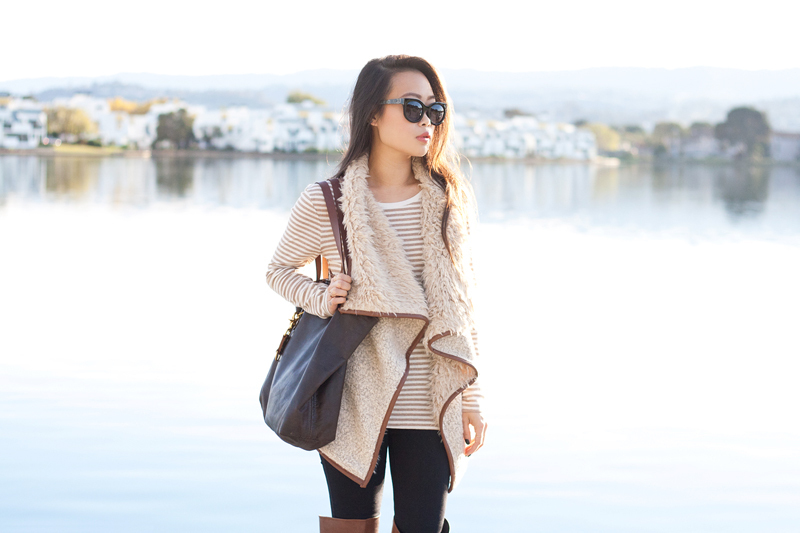 Faux fur knit vest c/o Wet Seal. Madison Ave. 2 Park Avenue fabric luxe small beau by Kate Spade. Celia tasseled loafers c/o Sole Society. Cusp ring c/o Tiffany Kunz. Two tone duality ring c/o Tiffany Kunz. And just like that, we are half way through November! I don't know about you but I am definitely in holiday mode. But before I go all out in holiday gears (think sequins and glitters and all things sparkly), I am going to remain somewhat low key until December. That simply means clothes that are fancy enough for a nice dinner party but still appropriate for running around during the day. 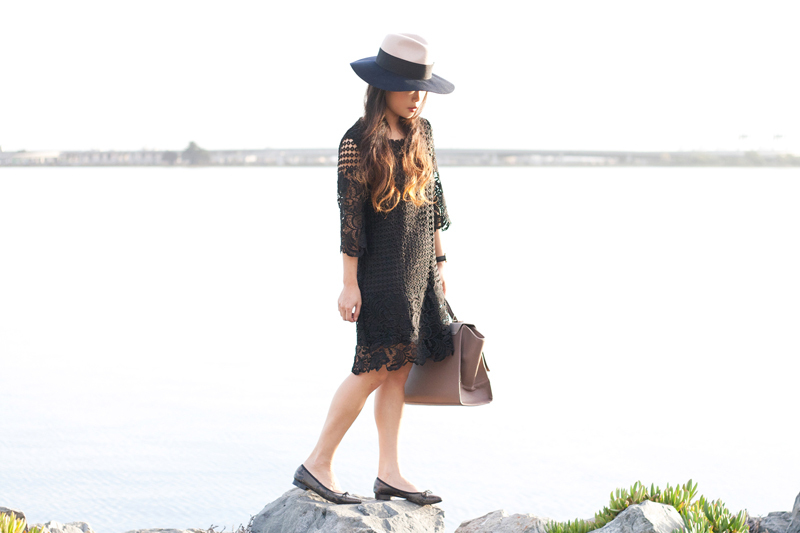 This crochet LBD is the perfect example... I wore it last Saturday to the movies, then to the marina, and finally to a family dinner! Paired with a two tone fedora hat, two tone satchel, and these stunning snake ballet flats, this look is casual yet put together! 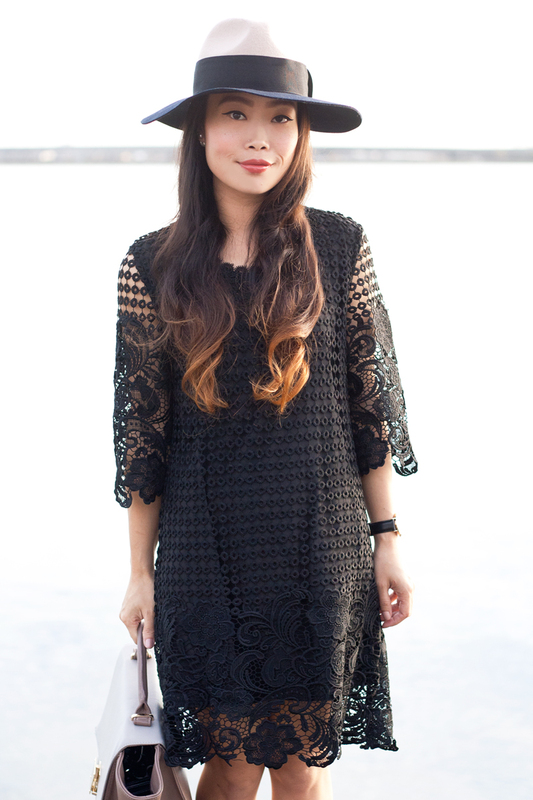 Crochet shift dress c/o F21. Camden snake ballet flats c/o London Sole. 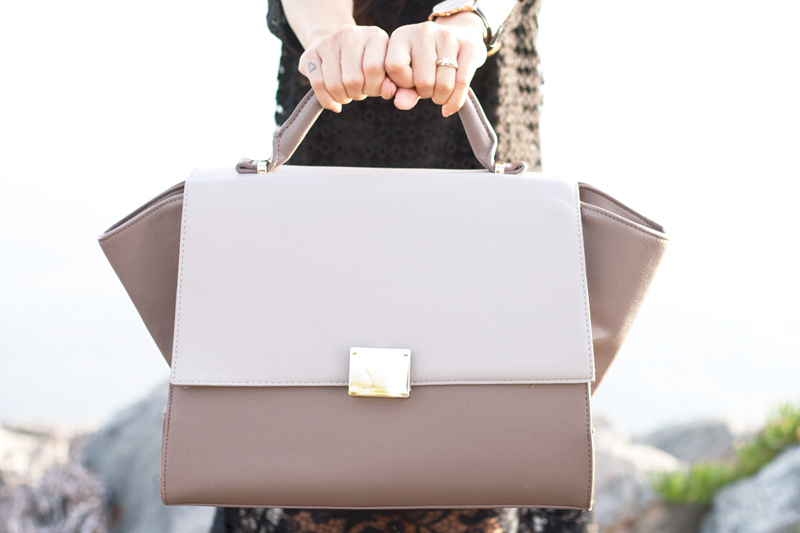 Two tone oversized satchel c/o F21. 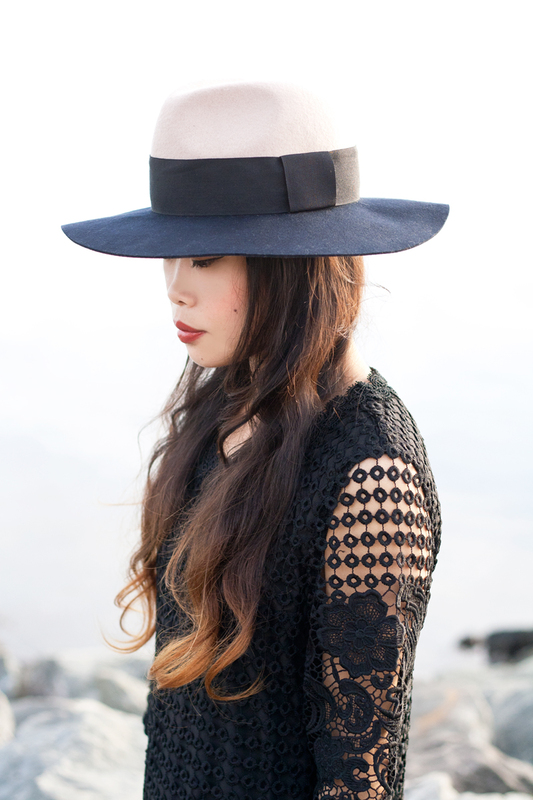 Two tone wool fedora hat c/o Mu Du London.